For questions regarding your tax bill, call our Helpline at 815-895-7337. Press 1 For the Assessments Office: If you need your parcel number, need to change a mailing address, or have assessment, property description, multiplier, or exemption questions. Press 2 For the County Clerk’s Office: If you have questions regarding tax rates or paying prior year taxes. Press 3 For the Treasurer’s Office: If you have questions regarding current year tax bills and payments. MasterCard credit or debit card, Discover, Visa, or American Express credit cards. A convenience fee of 2.35% will apply. Visa Debit card. A $3.95 convenience fee will apply. Direct Debit/E-check from your bank account. A $1.00 convenience fee will apply. No portion of these fees are paid to DeKalb County. 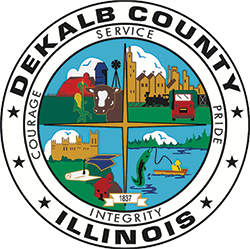 You may pay your taxes at most banks in DeKalb County during the bank’s normal business hours, on or before the due date of an installment. Bring the entire statement to the bank with you. Banks cannot accept payments after the due date. Please put your parcel number on your check. You may pay by mail. Send the appropriate stub and your check made payable to DEKALB COUNTY COLLECTOR, 110 E. SYCAMORE ST., SYCAMORE, IL 60178. Please put your parcel number on your check. Cash, cashier’s checks, or money orders, any time until October 25, 2019. Personal or Business checks, until September 27, 2019. MasterCard credit or debit, Discover, Visa, or American Express cards until Friday, October 18, 2019. A convenience fee of 2.35% will be added. No portion of the fee is paid to DeKalb County. Business hours are 8:30 a.m. to 4:30 p.m., Monday through Friday, except holidays. If a mortgage company is to pay your bill, it is your responsibility to call them and ask if you need to send them a copy of your bill. Many mortgage companies now pay electronically and may not require a bill. If you no longer own this property, it is your responsibility to mail the bill to the new owner. Installments equal to one-half the total tax are due on or before the due dates shown on the front of the tax bill, or the entire bill may be paid by the first installment due date. Installments unpaid by each due date will have interest added at the rate of 1.5% per month until they are paid. Property owners who have delinquent taxes remaining after the second due date will be mailed a delinquent bill and a $10.00 fee will be added to the amount due. A delinquent tax list will be published after the second due date. Additional costs and interest will be added at tax sale or forfeiture. A minimum charge of $30.00 will be added for checks returned to us by a bank and the tax payment will be voided. Failure to receive a tax bill, or receiving one late, for any reason, will not relieve the taxpayer from paying taxes or late penalties. Payments made on a wrong parcel cannot be refunded.